Gift Baskets available any time! An assortment of New Orleans treats in an iconic Louisiana Creole Tomatoes box, perfect for friends, family, clients & co-workers. Gift baskets include Zapp's Potato Chips, Barq's Root Beer, Aunt Sally's Pralines, Elmer's Chee Wees & 2 Free Snoball Vouchers! Substitutions available upon request, come on in put one together yourself! Everyone calls them a little something different. 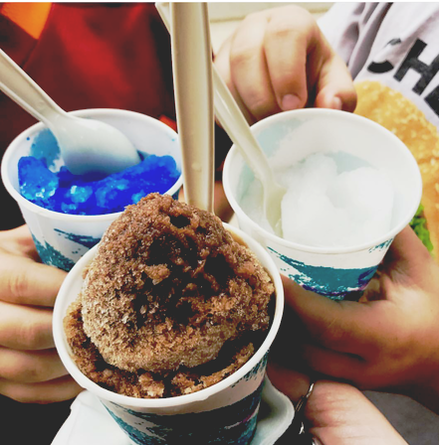 Where we come from, shaved ice treats covered in brightly colored flavors and the occasional creamy concoction (oh yeah) are called snoballs. Founded by bonafide transplants from New Orleans, Louisiana: NOLA snoballs is bringing this legendary delicacy to Dallas. It's an affordable family outing and we've got Aunt Sally's pralines and more New Orleans items to come. Our logo borrows the iconic tiles seen around the crescent city streets in order to signal to other New Orleans natives that this is the real deal we all grew up with-and we can't wait to let Texans in on this sweet secret. Plus, kids (and adults too) will love Maureen Ehrlicher's legendary pez collection on display! Our storefront is just a few blocks from the Bishop Arts District (between Bishop and Madison streets) and has free parking behind the building! Feel free to give us a call if you're unsure if we're bearing the cold! We also pop up at events around the city, check out our calendar to see where we will be next! But, we'll always be open in Oak Cliff no matter what events are going on. The Maher Clan for backing us since day one, Chris and Sonya Eudaley for loads of support and advice, Linda Holt and Joe McElroy who helped us get it all stated, And all our neighbors, family and friends who have encouraged us all the way—Thank you!